I considered titling this post, “What to wear when you feel like sh*t but still need to go outside” for that is exactly what happened to create this look. Saturday it was raining and I felt under the weather. I didn't plan on leaving the house; I slept in for the first time in a long while, threw on some comfy clothes and plopped down in front of my computer to work on blog content for the coming week. However, I had to leave my house to attend to a few things and pulled myself together in a few minutes. Quick glance, I look pulled together thanks to accessories. 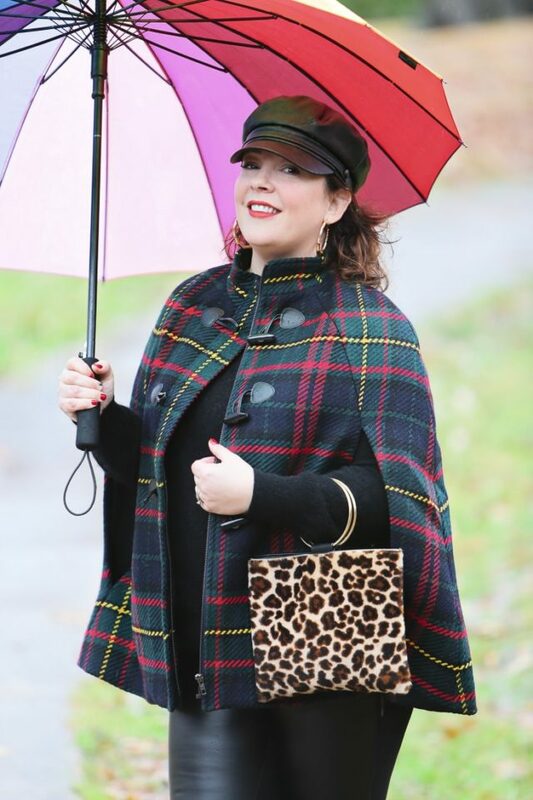 Talbots sent me this cape a few weeks ago and it's been too cold to wear it until this day. It makes such a strong statement you hardly notice I'm wearing an old pilly cashmere sweater underneath. The leggings are Old Navy; they aren't Holy Grail faux leather leggings but they're a great price and have been through the washer and dryer a dozen times and still look new. 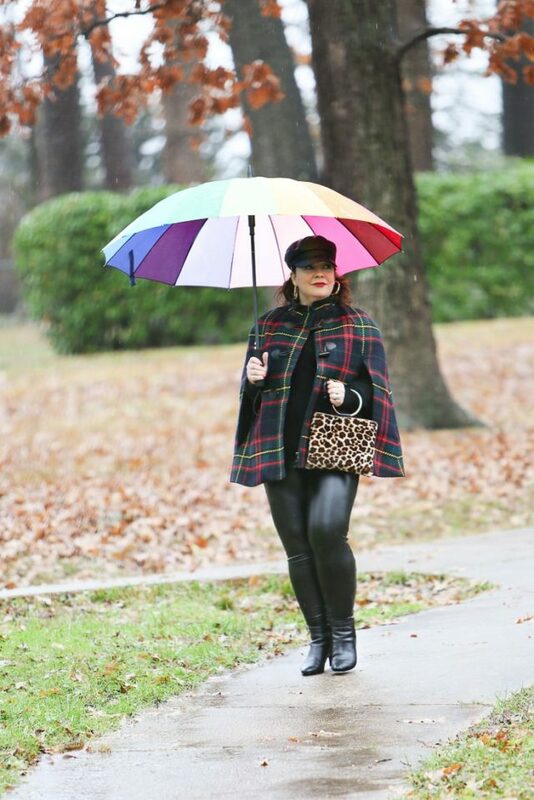 They're stretchy and warmer than normal leggings and look more polished. I mentioned in Saturday's Weekend Reads how I wear these boots with my faux leather leggings; I think they create a nice consistent line. The hat was an impulse buy last fall that I considered returning. So glad I didn't, as it's a brilliant way to look pulled together when you're not. This hat is sassy while covering bedhead or grown-out roots. The same hat is no longer available but I've linked to similar ones in the carousel at the bottom of the post. The bag I still had in the dining room from a different occasion so I threw my wallet and lipstick in it and headed out. And speaking of lipstick… a red lip can do wonders for a sick, tired, or bare face. This is my favorite red, it's a great price and looks good on me all four seasons of the year. Often we have choices on what we add to our wardrobe. We can choose a variety of colors in a sweater, we can decide on weight and pattern of leggings, a baseball cap or a baker boy hat. When you take the time when you feel good to make smart decisions on your wardrobe additions, it's easier to not look like sh*t when you feel like shi*t. It's also easier to live with a smaller wardrobe since it's more functional and purposeful. We're heading into the post-holiday sale season, I encourage you to shop with just as much care as you would if items were full price. If it's not what you need, if it doesn't work with what you already own, if it doesn't work with the life you actually lead, and if it doesn't make you happy… don't buy it. 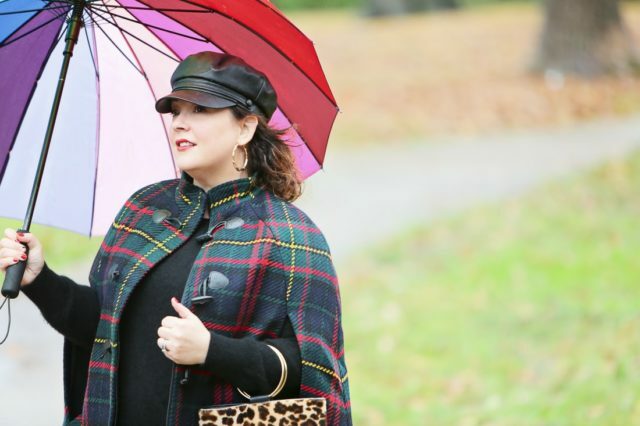 But don't be afraid to add some unexpected things like a plaid cape or a faux leather cap to your closet as it may be just the thing you need for a rainy day. I picked up the leggings at Old Navy today for $10.39, many of the 7/8 styles are in the clearance area. I love this look! That cape! I’m a hat person too but I find I buy them and don’t where them nearly enough. I was the same, it’s just been in the past year where I’ve felt comfortable wearing them more often. 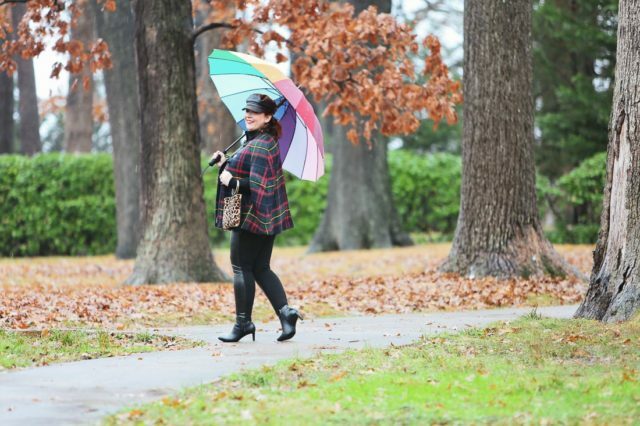 It also helped by having them with my coats instead of in my closet! I love capes. I used to wear a vintage 1960s cape back in college- it belonged to my mom. Thing is, they are impossible to drive in! I feel too constricted. Unless I’m walking around, with no car rides in the plans, I have stopped wearing capes. I hear you! I wore a vintage cape of my mom’s and I felt like my arms started at my elbows! This one, maybe because it’s wider and shorter, I don’t have the same issue. While it’s awkward to throw a shoulder bag on with it, I had no trouble driving, carrying a box of oranges, and doing various tasks all day.